Middle East and North Africa (MENA) is a priority region for the Norwegian branch of the Nordic Women Mediators, in its work to contribute to enhancing women’s participation in peace and reconciliation processes. This week a group of network members got a chance to engage with women mediators from the Mediterranean Women Mediators Network. The two networks work under very different conditions, but towards the same overall goals – increased inclusivity. 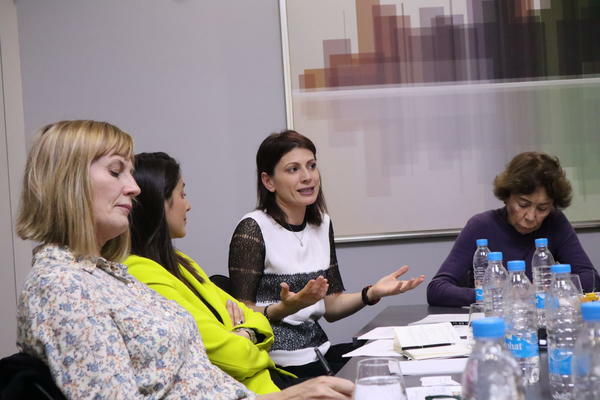 The meeting gave the participants an opportunity to have a focused discussion about how the networks can contribute to strengthening women’s involvement and the role of women mediators. Comparing and contrasting the networks’ strengths and challenges inspired greater insight and acknowledgement of the complementarity and potential areas of cooperation between the Nordic and Mediterranean networks. 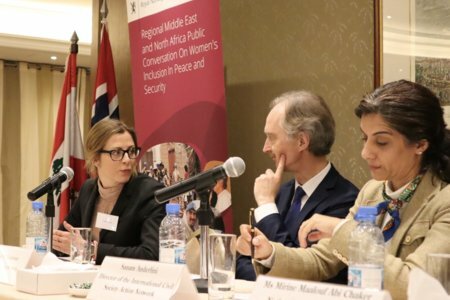 The visit included participation and contribution to a high level meeting on women’s participation in peace and security in the MENA region, organised by the Norwegian embassy in Lebanon. Norwegian mediator and Special Envoy to the Philippines, Idun Tvedt, took part in a panel together with experts from Lebanon, Algeria and International Civil Society Action Network (ICAN), in addition to UN Special Envoy to Syria, Geir O. Pedersen. The debate focussed on the barriers and ways forward for women’s meaningful participation in peace processes. In her intervention, Tvedt shared key takeaways from her experiences from working with the Colombian peace process, in addition to insights on how to make effective arguments for a sound gender approach, from a facilitator's perspective. 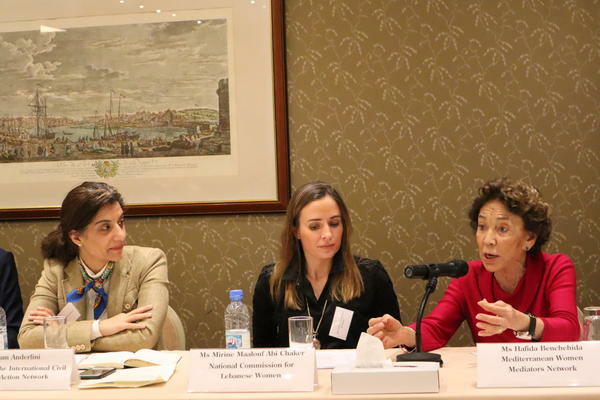 Among many aspects she highlighted the need for a gender commission with a strong mandate, connection to the table and support from the delegation heads. She also emphasised that much can be done in the absence of a national peace process, in the preparations for a future peace process: "In the Colombian process women’s groups helped prepare the ground for the peace talks in Havana" she said. "It requires long term strategies, preparations and persistence over more than a decade". NOREF participated with network members Frida Nome, Marte Heian-Engdal and Helene Revhaug, in addition to project adviser Christine Eliassen. NOREF and Peace Research Institute Oslo (PRIO) are the Norwegian operational partners of the Nordic Women Mediators. More about Nordic Women Mediators.